This weekend I discovered a new game, Cards Against Humanity. It’s subtitled “A Party Game For Horrible People” and the only thing I knew about it before now was that it’s almost impossible to get your hands on. It’s rare to catch it online when it’s not sold out. And after playing it, I can tell you, there’s a very good reason for this. If you’ve ever played Apples to Apples, Cards Against Humanity will come to you pretty quickly. Just like in Apples to Apples, one player picks up a card that has some sort of descriptive text on (the black cards) and each of the other players puts down a card with a noun on it (the white cards) and the player who drew the black card chooses the white card he likes best. Whoever gets the most black cards wins. Where it differs from Apples to Apple is subject matter. There are black cards that say things like ‘What ended my last relationship?’ or ‘how did I lose my virginity?’ and the white cards say things like ‘icepick lobotomy’ and my personal favorite ‘two midgets shitting into a bucket’. The game is a blast. We were laughing so hard that we couldn’t breathe. We were laughing until we needed to take breaks, as if we were in the middle of an intense workout. I think it’s way more fun than Apples to Apples because it solves the major problem of that game. Apples to Apples isn’t fun with a group of people you don’t know. It requires a certain amount of knowledge of the people you’re playing with. Cards doesn’t need that. Tactless humor is fairly universal and anyone has a great chance of winning with any group of people. One final great thing they’re doing is offering the core game for free via PDF. You need to take it to a print shop or similar place to have it put together, then you’ll need something to keep it in. They go through all of this in the PDF, which you can find here. If you get the chance to play this game do it. And if you can purchase this game, don’t hesitate. Recently I was able to play an RPG for the first time in years. It was weird being on the other side of the table. We made characters and jumped right in. 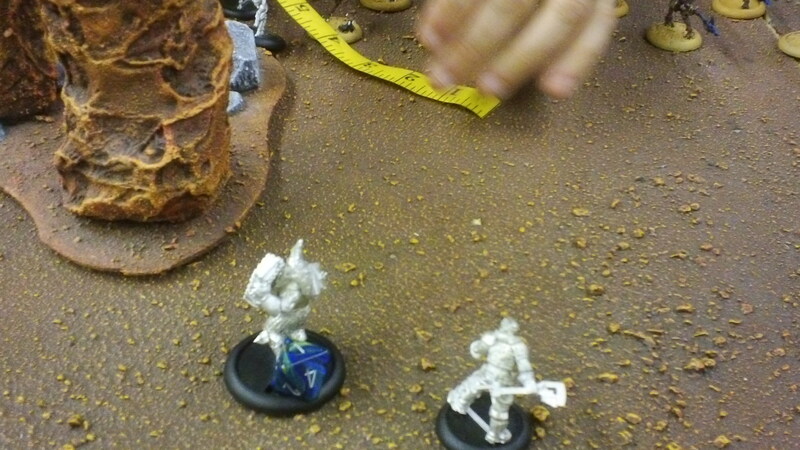 My friend was running Nightbane by Palladium games. I don’t have a ton of experience with Palladium; I know they made a lot of games in the Eighties. The extent of my experience is that I had a copy of Heroes Unlimited pass through my hands. I donated it to my college’s gaming club. I remember it having a lot of charts that you rolled a percentile on to generate powers. Nightbane wasn’t much different. There were a lot of charts (that we didn’t find out about until later) that turn you into quite the hideous monster. In Nightbane, you play as a typical Eighties movie monster. It’s a pretty cool setting, all of it very old school horror. Being a huge fan of that sort of thing, this game really hit the spot for me. Our DM made a smart decision by not having us finish our characters until we transformed for the first time. Usually I don’t like rolling to generate anything in a game, but this time it was a blast. Maybe the idea of a hideous transformation appealed to me because I’ve been watching too many horror movies lately. I rolled and found my humble mechanic transformed into a were-weasel with sixteen arms and missing patches of skin. When I suddenly transformed into a horrible beast and killing a mugger it was awesome. So we ended up having a neat little session where our characters transformed, dealt with the fact that they were no longer human, ran from the police, and fought a weird creature. It was fun. I forgot the simple joy in showing up and letting someone else take my imagination for a ride. I found myself absorbed in a way that just doesn’t happen when I’m running the show. The main thing to take away here is to keep things in perspective. If you usually run the game, never ignore a chance to play. It will give you new ideas, a new view of gaming, and refresh you for the next session you run. It’s always good to be on the other side of the table. I’ve recently taken up a new game. It’s a departure from my normal diet of RPGs and board games, but I’m smitten with Dark Age. Dark Age is a miniatures game I’ve written about before that has slick and fun rules, some of the best miniatures I’ve ever seen, and incredible fluff. In the game, you take control of a warband from one of various factions and fight on the world of Samaria. That decision took me a long time to make but I eventually decided to play the Outcasts. The Outcasts look like characters from The Road Warrior series of films. There is even a unit of kids with boomerangs, just like the kid in the second movie. 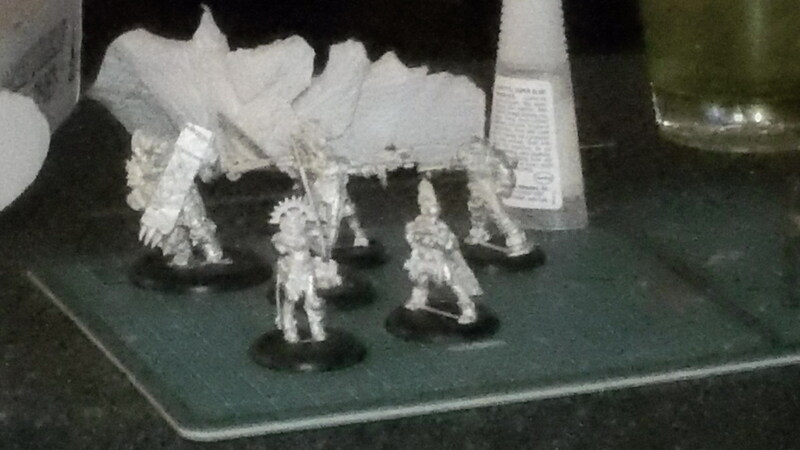 Initially, I purchased a Manhunter, a Fixer, a Brute (the second sculpt), and a unit of Wasteland Warriors. The models are, as I said, incredible, but they’re all metal. I’d forgotten how hard metal was to glue until I tried it again. These are easier than most however. The few models that aren’t one piece have joints in such a way that gluing is very easy. 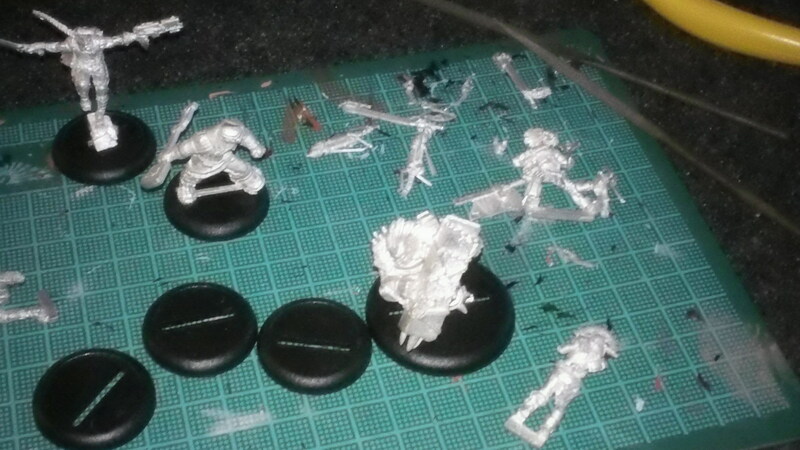 My first batch of Outcasts coming together. Eventually though, I did have to break out some heavy duty stuff. The glue I was using, Zap a Gap, wasn’t doing the trick and my roommate lent me Locktite. Locktite holds metal together in the most incredible way and is very inexpensive. I haven’t started painting yet, but I plan on a darker color scheme. Black leather, tanned skin, rusty weapons, that sort of thing. What I have here is 350 points. The list does not play well. The core of Warriors and the Brute hold up nicely, and the Fixer is great for keeping them up. But the Manhunter is just too many points at 350. If he’s on a roll, he can be worth every point and more, but if not he just disappoints. The Brute (or Brutes if you’re feeling enterprising) hit like trucks. They can also take a beating. 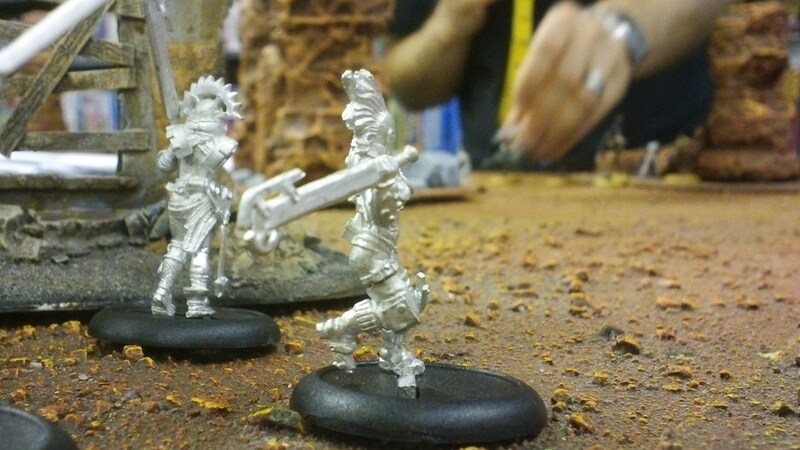 Wasteland Warriors are great troops for shooting or close combat, wherever they’re needed. 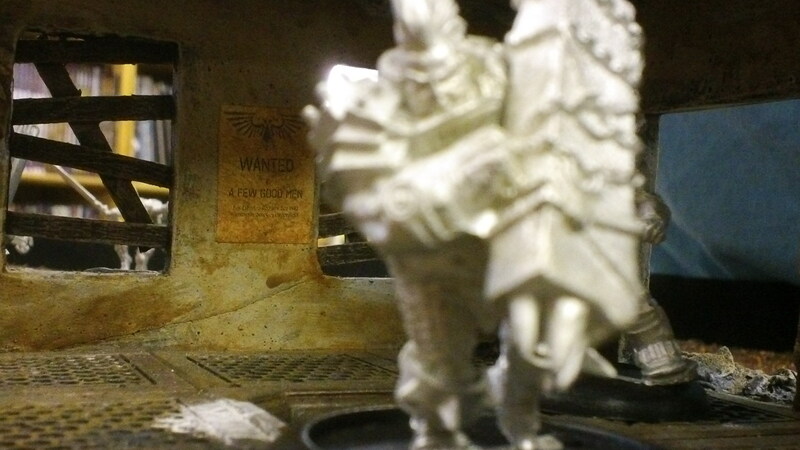 Where they really shine, however, is when they’re softening up enemy targets for a brutal charge from the Brutes. Keep checking back as I work on my Outcasts for more updates and reports on how they play out as I expand to higher point games.